Semtech’s LoRa long-range, low power wireless platform is a groundbreaking technology enabling our world to become a smarter planet. LoRa wireless products are the ultimate solution for eliminating repeaters, reducing cost, extending battery life, and improving network capacity. 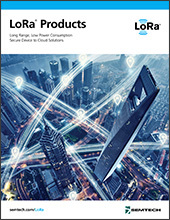 LoRa gateways are intermediaries that allow sensing devices to transmit data to the Cloud. LoRa transceivers feature a long-range wireless modem that provides ultra-long range spread spectrum communication and high interference immunity while minimizing current consumption. Access open source LoRa software downloads. Download open source software for arm processors. A free, non-commercial LoRaWAN network server is an opportunity for companies to explore innovative use cases and have a secure area to evaluate their LoRa-based applications. Users will be able to test key capabilities, including on-boarding gateways, view sensor data log and network activity, and forward data to an application server for visualization and processing compliant with the LoRaWAN specification. Semtech’s free demonstration network server is available at the links below. LoRa Cloud™ Services will deliver easy to use tools for solution providers to deliver value more rapidly with less development overhead. LoRa Cloud Geolocation: This service enables developers to quickly build IoT solutions which leverage multi-modal location capabilities (including Wi-Fi, GNSS and LoRaWAN-based geolocation) without taking on the development complexity (and repetition) involved in building a solution from scratch. The service is designed from the outset to support flexibility in deployment options, cost effectiveness and ease of use. Download white papers to learn more.